Disappointingly, this isn’t one of those doom-and-gloom articles proclaiming that SEO/PPC is dead. Instead, we’ll look at how voice search will shake things up for us digital marketers and examine all the wonderful things that can come from it. But first, here’s a question for you. If you wanted to find out who Microsoft’s current CEO is, what would you search for if…. a) You were on your computer and typed in your search phrase? b) You were talking into your phone using a digital personal assistant such as Siri or Cortana? Without even being conscious of the fact, you’ve altered your search behavior for voice vs. text. Search is finally growing up. Take the latest announcements from Microsoft (my employer) at their recent Build event. Microsoft CEO Satya Nadella talked about a world where “human language is the UI layer” and developers build for “conversational canvases,” a new term applied to any app where people are conversing, from email to chat to SMS. Slack, too, has written about “conversational offices” where computer systems – such as expense reporting software – are made more convenient and user-friendly via an interface we can talk to. All those times you’ve wished for a better way to understand intent and personalize more effectively? Natural language could be the key. Voice-activated technology is going to switch things up for us marketers, in many beneficial ways. That’s what I’m going to cover here. Specifically, I want to dig into voice search. What do I mean by voice search? When I say “voice search” I’m referring to your smartphone or desktop computer that has a digital personal assistant or an entry point that uses voice, like Google’s microphone or Amazon’s Echo. In most cases, if you’re using a personal assistant and activating with your voice, you’re doing some kind of voice search. And that is the element of voice command I’ll be referring to. Who’s actually using voice search? How is it different from text input? What can you do to prepare for these differences? Most of us reading this article are likely to be regular users of digital personal assistants. We’d expect the high volume of 18 to 43 year olds, since statistically they fall into the early adopters bucket. But to me, the higher usage numbers for 44+ age ranges were pretty surprising. Perhaps it could have something to do with usability? Tiny screens and even tinier buttons can be difficult to navigate – voice search is easier. The Thrive Analytics study was from late 2014 and, given the speed at which this technology is advancing, the adoption numbers have grown dramatically. It appears we’re all feeling less silly talking into our phones and are rushing to embrace the convenience of these digital personal assistants. 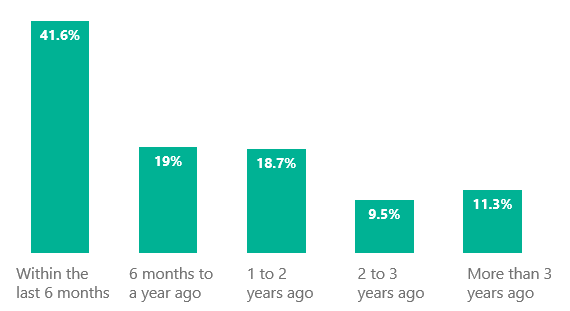 According to a survey conducted in October 2015 by MindMeld, most folks only just started using voice search and voice commands within the 6 months prior to when the survey was conducted. Recently at SMX West, Google’s Director of Conversational Search Behshad Behzadi presented a keynote on how Google is approaching voice search. Behzadi shared that Google has seen the ratio of voice search growing much faster than text search. He attributed that in part to the fact that people are increasingly comfortable using speech commands, and also because of the quality of results. What are we using voice search for? This is the big question – what are we using it for? This graph shows the general use of voice search, from a Northstar Mobile Voice study. Why do you think so many people are asking for directions? Are we all lost? Maybe we need an assistant to help us out in life. Interesting and quite possibly true. It just so happens that at Microsoft we have one of these – with Windows 10 launching this past summer with Cortana. 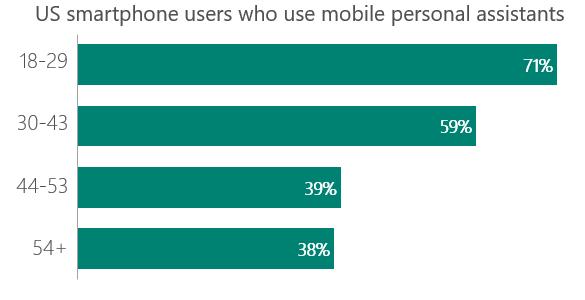 Thus, I bring you amazing (IMHO) data on what people are using Cortana for. 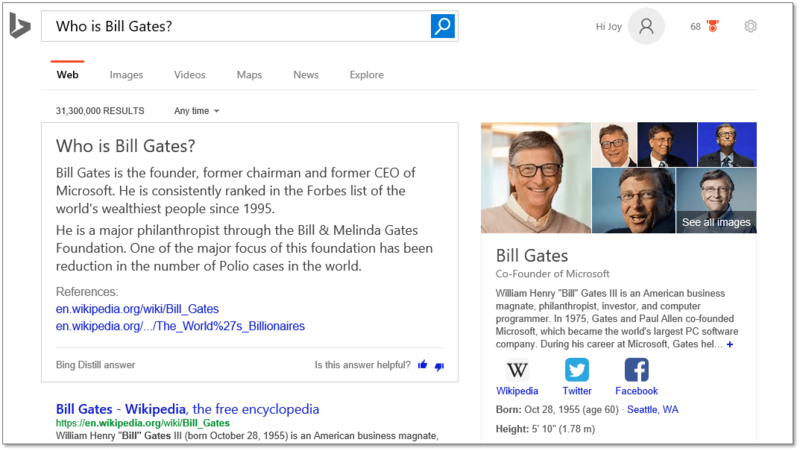 As a slightly humorous aside: Cortana’s top search is “Who is Bill Gates?” I think it’s because people are expecting a jokey answer. 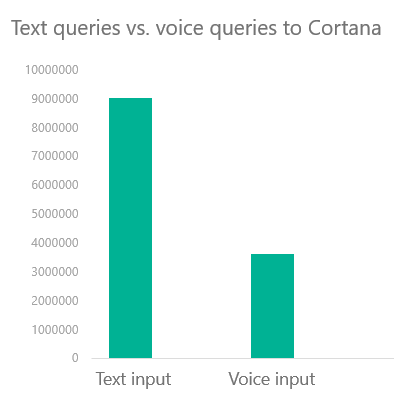 One-third of all Cortana queries come from voice. We cannot measure which queries coming into a search engine are coming from text input and which are coming from voice input. But we can measure what queries via Cortana are happening from text and which from voice – because Cortana is part of the Windows 10 operating system. This data was pulled in November, just three months after Windows 10 launched, and already 33% of queries are coming from voice. This is incredible! I’m very interested in getting another look at this data in a few months, when we’re one year out from the launch of Cortana on the desktop, making voice search super accessible around the world. Where it impacts us digital advertisers is how this relates to searches. We all know that voice searches have results in SERPs. 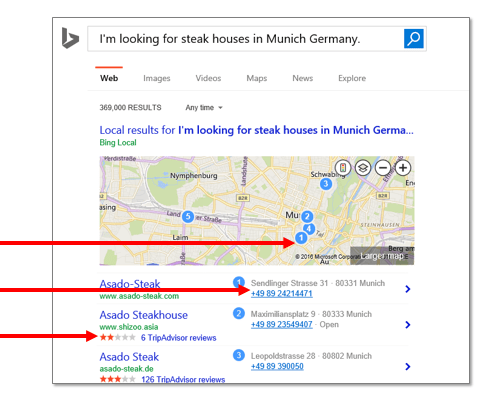 Interestingly, a voice search query can sometimes indirectly lead to a SERP with ads being served as well. 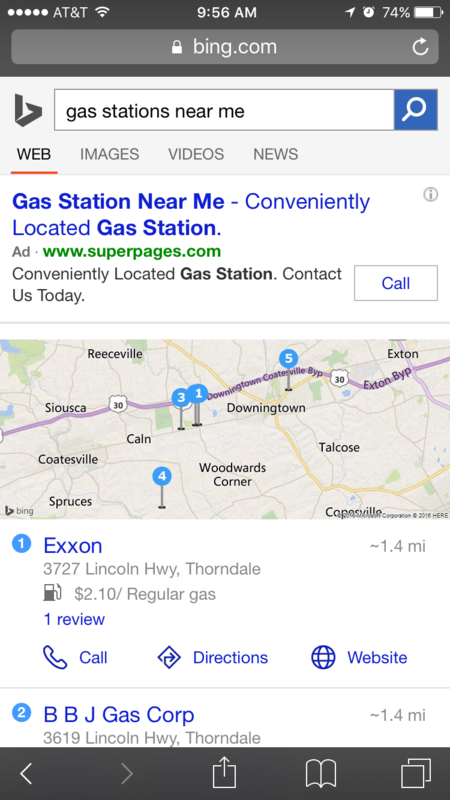 Are your ads showing up as a result of a voice search query? This is the reason we need to pay attention. Okay, we’ve seen that voice is here to stay and it keeps growing, so let’s explore the five most important ways voice and text search differ. The first thing we think about is query length, right? They must be different. We pulled data for query length for Cortana searches and compared that with query length for general text searches. Not surprisingly, query length for text searches is pretty short, about 2 words. We’re using computer language – it’s not a sentence, it’s the most direct route to express our intent. Then we looked at query length for voice search. What you can see is that the successful voice searches, the ones that get the most volume, impressions and clicks, are the ones with 3 words in the keyword or query. I thought the query length for voice searches would be significantly longer than for text-based searches. But again, we’ve just started learning how to use voice search. We ran these tests 10 months ago, and I expect a follow-up would show longer query length for speech. Notice the degree of self-selection and specificity. We’re all going to be trained to search like this one day. While broad or phrase match targeting may help account for these longer keywords, it’s not necessarily conversational and thus may not cover the ways people search with voice. Voice search differs from text search in the usage of question phrases. Just like in our “Microsoft CEO” vs. “Who is the CEO of Microsoft?” example. Try adding some relevant question keyword phrases to your keyword list as a test. What is the cost for air fare to Bahamas? How much does it cost to fly to the Bahamas? Where can I find Bahamas vacation info? What’s the best Bahamas vacation package? When is the best time to travel to the Bahamas? Who lives in the Bahamas? What time is it in the Bahamas? This might be the most important difference of them all, since natural language shows intent more strongly. If I were to do a search for “digital camera,” you’d have no idea whether I wanted to buy one, have one repaired, or was simply looking for stock images of cameras. While we digital marketers think we can draw some conclusions based on these words, we actually have no idea if this searcher wants to buy or is doing research. Here’s where the natural language usage within conversational search changes everything. 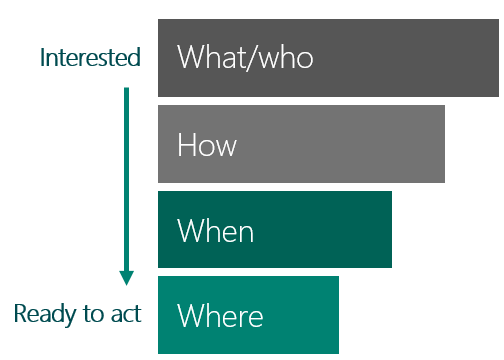 Finally, getting detailed insights into intent can prove extremely effective from both an ROAS as well as conversion rate standpoint. You could also consider tailoring the ad copy and landing page more specifically towards the highest-value questions asked. Mobile voice search is three times more likely to be local-based than text search. This is closely related to the fact that most smartphone searches are also local. It means you need to sharpen your approach, because voice search is rapidly becoming the way your customers will find you. If you have a local physical presence, it’s even more critical that you refine your strategy because you have a lot more to gain by getting this right. Are there landmarks you need to call out, such as “in old city” or the stadiums or anything else significant that will be a cue for your searcher? What are the local places of interest that matter to your company? How do folks describe your neighborhood in natural speak? These are distinctly local searches and they trigger ads in the SERP that allow the user to act without going to a web page. You can see reviews, a phone call button, and a “book now” button. Users don’t have to come to your website to complete their intention. This will have a strong impact on crowd-sourced sites, such as Yelp and TripAdvisor, where it’s your company’s responsibility to update hours and phone info, as well as to monitor and respond appropriately to customer reviews. Make it a priority to keep your local listing, your business listing, and your crowd-sourced sites updated and active. These sites have a great deal of power when the search doesn’t leave the SERP. For example, is your address correct? What about your hours and your phone number? Are there customer reviews you need to manage? It’s worth the time to keep these all spiffy and up-to-date. TL; DR? Here are the five core ways conversational and text search differ. Looking into the future, one thing is certain. We. Will. Adapt. Voice search will be adopted. We’ve proven time and again that we can be trained – think about the first time you learned to swipe using an iPhone. Or the way we learned to take selfies… I resisted for as long as I could before joining the dark side. 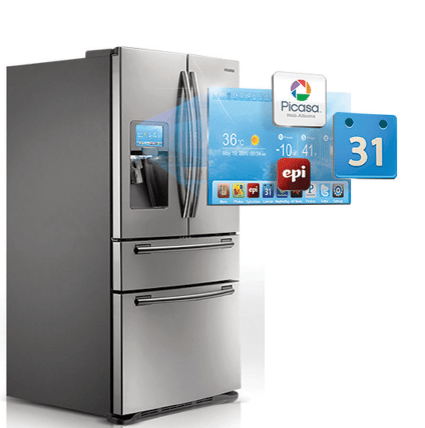 Another development that will have an impact on voice search will be the Internet of Things. Between wearables and common household objects, we’ll be communicating more with them using voice commands. One of the most critical expectations we’ll develop from this specific use of technology is the expectation that it will anticipate our needs. This is called predictive response. Let’s think about that in action. Your phone can capture and communicate signals about you. Let’s say I’m walking around Seattle and I decide I’m feeling a little hungry. I’ll ask Cortana or Google Now, and she will know that it’s breakfast time and that I’m on foot. She’ll also know that it’s a little cold and rainy. If I asked her for the nearest cafe, she’d respond with an answer that factors all that in. She’d even cross-reference this with my love for cappuccinos to find me the nearest coffee shop that sells cappuccinos with plenty of indoor seating so I can be warm and dry. Better still, with the new chatbot technology, my digital personal assistant could even suggest I might like to book a table and communicate with the table booking bot to have my table booked. We’re happy to give up more personal information to these personal assistants because of the convenience they provide. This additional data could be helpful when it comes to targeting and personalizing ads in the future. It’s also inevitable that there will be a rush to monetize. Between the tech giants like Google, Microsoft, Facebook, or others, someone is going to figure this out. 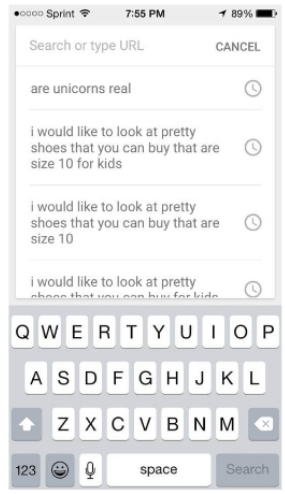 Already we can see articles talking about Google working on conversational shopping in the SERPs. We’re poised to see this industry take a seismic shift. It’s exciting and exhilarating most of all because we can be a part of the change. We’re not being handed brand new technology (think iPhone when it first came out), but more so that we have a hand in what is seen as normal, what we can accept and expect, how we as advertisers can be even more effective with intent and personalization and targeting. We can shape this together. Why not use your voice? Share your thoughts in the comments below.